Here’s a bit about each of our four panelists: Nate Thompson, Dan Fortin, Ron Mashburn and Elisa Alvarado. Nate Thompson has been a property manager for more than 20 years and is presently general manager of TurnKey Vacation Rentals. A world traveler, he was born on the Caribbean island of Bonaire, grew up in Chicago, proposed to his wife while they lived in San Francisco, married her in Hawaii (where she was born), lived south of Cancun Mexico, as well as South Padre Island Texas, and Isle of Palms South Carolina. So, he comes by his vacation roots honestly. Nate is a Wheaton College graduate, a licensed broker in charge in North and South Carolina and will soon earn Accredited Residential Manager designation. He has been a real estate investor for more than 20 years and has bought, fixed up and sold foreclosures, leased and managed residential and commercial properties, managed homeowner associations and worked with many of the area’s best known real estate companies. Contact Nate at nate.thompson@turnkeyvr.com. Dan Fortin is a third-generation real estate and construction professional and is broker and owner of WNC Mountain Rentals, LLC in Hendersonville, specializing in vacation rental property management. He graduated with high honors from Park College, where he studied computer science and management, while serving seven years in the United States Air Force. He worked the next 7 years as a computer analyst and then 10 years in construction before becoming a full-time real estate broker. He has 35 years experience as an active investor, and 15 years advising investor clients. Dan has specialized in land development, new construction, historical home restoration, and fix-and-flip opportunities, but focused on vacation rentals when moving to Western North Carolina in 2014. In addition to enjoying outdoor life, he enjoys cooking, reading and playing golf. Dan offers advice and consultation, sales, leasing and purchasing assistance, as well as professional vacation rental property management and maintenance services through WNC Mountain Rentals, LLC. Dan can be reached at daninwnc@gmail.com. Asheville native Ron Mashburn is a licensed North Carolina real estate broker. He studied engineering and computer science at A-B Tech and the University of Tennessee. Passionate about construction and real estate investing, he launched his business in 1986 in Raleigh, North Carolina. After years investing in real estate he began investing in vacation rental properties and now owns a vacation rental property management business, WNC Realty & Rentals. In his spare time, Ron enjoys vegetable gardening, raising farm animals, hiking and restoring vintage motorcycles. Ron can be contacted at ron@wncvacations.net. Elisa Alvarado was born in Puerto Rico, raised in Chicago, and did a stint in Santa Fe before moving to our beautiful Appalachian Mountains 15 years ago. "I am new to the real estate business and opened my first Airbnb last Labor Day,” she says. “This October marked the opening of my second! 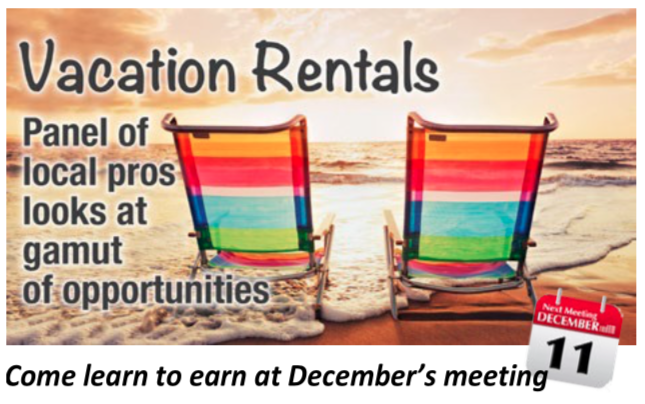 I look forward to this opportunity to discuss and learn more about vacation rentals." Contact Elisa at elisamalvarado@gmail.com. This is a must attend education and networking opportunity. See you Monday, December 11, 2017 main CREIA meeting.